Perpetual Internet analysis — SiteAdvisor Enterprise relies on McAfee Global Threat Intelligence — our cloud-based rating service that continually scans the Internet with intelligent bots or virtual computers, downloads sites, and scans them for malware. The bots even fill out registration forms to determine whether signing up triggers spam. If the site contains malicious code or other suspicious activity, SiteAdvisor Enterprise marks the site “red” for risky. Enhanced security powered by McAfee Global Threat Intelligence — McAfee Global Threat Intelligence (GTI) is a comprehensive cloud-based threat intelligence service. Already integrated into McAfee security products, it works in real time, 24 hours a day, to protect customers against cyberthreats across all vectors — file, web, message, and network. McAfee GTI offers the broadest threat data, most robust data correlation, and most complete product integration in the industry. McAfee’s GTI network allows enabled products to evaluate threats on multiple vectors in real time, leading to faster identification of threats and higher capture rates. 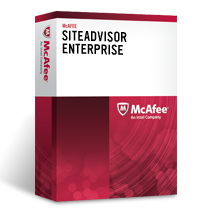 SiteAdvisor Enterprise uses the McAfee GTI web reputation and web categorization services to identify sites that are hosting malware, infected by malware, and hosting inappropriate content. Now you can feel confident about using the Internet as a valuable business resource. With McAfee® SiteAdvisor® Enterprise, your employees can surf and search the web safely as threats like spyware, adware, and phishing scams are blocked. Integrated into McAfee solutions, McAfee SiteAdvisor Enterprise technology adds web security to your comprehensive protection, guiding end users away from malicious websites and shielding them from online threats. Guard your employees and your organization against web-based malware like adware, spyware, viruses, and phishing scams. Use McAfee ePolicy Orchestrator (ePO) software to deploy, manage, and report on McAfee SiteAdvisor Enterprise solutions across your entire organization. Research on the web without unintentionally wandering into dangerous territory. When you search with Google, Yahoo, MSN, AOL, Bing, or a variety of other search engines, you get a safety rating next to each search result. Use SiteAdvisor as a plug-in for Microsoft Internet Explorer, Mozilla Firefox, or Google Chrome. Identify sites that are safe, and those that are not, with our color-coded rating system. Prohibit access to undesirable websites by using SiteAdvisor Enterprise. You can also customize SiteAdvisor Enterprise to permit access to whatever risky sites you deem necessary. Strengthen your web security and ensure around-the-clock Internet protection for remote employees. McAfee Web Filtering for Endpoint is an add-on module to SiteAdvisor Enterprise that provides secured web access for anyone using the Internet for work-related or personal business — in or out of network. Surfing the Internet can be like traversing a minefield. Every day, Internet users perform billions of web searches. Threats like adware, spyware, malware, keyloggers, and password stealers lurk behind seemingly innocent websites. Disreputable websites can seed end users’ desktops with data-hunting Trojans that are bundled into adware or free applications. Or they can lure visitors into sharing personal information that can be used for spam campaigns or identity theft schemes. The odds of visiting a risky site in a given month are very high—and are increasing every day. But the web is a valuable business resource that your employees use daily, so it’s critical to protect them from online exploits without limiting their access. With McAfee SiteAdvisor Enterprise, you don’t have to impose restrictive policies. Compatible with Microsoft Internet Explorer, Google Chrome, and Mozilla Firefox, McAfee SiteAdvisor Enterprise solutions warn or block employees from interacting with dangerous websites and give them the freedom to search and surf online while being protected from web-based threats. And, with the advanced antiphishing and blocking capabilities, you can customize your policy to restrict access to potentially harmful websites. Innovative McAfee technology automatically monitors the most common online activities, such as using search engines, browsing websites, downloading files, and providing email addresses to sign up for product registrations, services, community access, and newsletters. The website’s email and download practices are evaluated using our proprietary data collection and analysis techniques. Downloads are analyzed by installing software on our test computers and checking for viruses and any bundled adware, spyware, or other unwanted programs. The site is examined to see if it engages in annoying practices, such as excessive popups, fraudulent practices, and browser exploits. Registration forms are completed using a onetime use email address to track the volume and spam content of subsequent emails. Finally, we combine our review with feedback from our users and site owners and alert you about sites that are deemed suspicious by our staff or by our reviewers. Our automated testing procedures continually monitor the web and update the safety ratings based on new information. McAfee SiteAdvisor Enterprise is fully integrated with McAfee ePO software, our industry-leading security management platform. By using McAfee ePO software, you not only deploy McAfee SiteAdvisor Enterprise to the entire user group with a few clicks, you can also manage its policies andrun various reports to monitor web usage within your organization. McAfee SiteAdvisor Enterprise policies are stored on the host, thereby ensuring that the Internet usage policies are enforced whether the user is on or off the corporate network. McAfee SiteAdvisor Enterprise’s hardening policy prevents end users from disabling its plugin. McAfee SiteAdvisor Enterprise can be configured to stand down when it is within a corporate network by checking for an external website or by accessing an internal-only server. McAfee Web Filtering for Endpoint is an optional add-on to McAfee SiteAdvisor Enterprise and integrates with it to help organizations manage productivity, reduce legal liability, and improve bandwidth to make employee Internet use efficient and effective. McAfee Web Filtering for Endpoint is a module enabled in McAfee SiteAdvisor Enterprise allowing administrators to define a user’s browsing environment based on site content categories and create detailed reports on web usage. This ensures that Internet usage policy is enforced when a user is both on or off the corporate network. As the workforce becomes more distributed and mobile, the need for web filtering and protection to seamlessly transition from the office to the road becomes increasingly important. McAfee customers who use McAfee Web Filtering for Endpoint and McAfee Web Gateway can take advantage of this integrated, gateway-aware solution to intelligently enforce the appropriate policy, whether the end user is at a corporate office and behind McAfee Web Gateway or outside the network. SiteAdvisor Enterprise browser plug-ins are less than 800 KB for all supported browsers. Download the McAfee SiteAdvisor Datasheet (PDF).